Google labs are continuing to improve image search. Image search has been a part of Google since 2001 and is a huge timesaver for anyone attempting to find specific images. Advanced image search lets you search for an image and filter it by color, file size, aspect ratio and more. 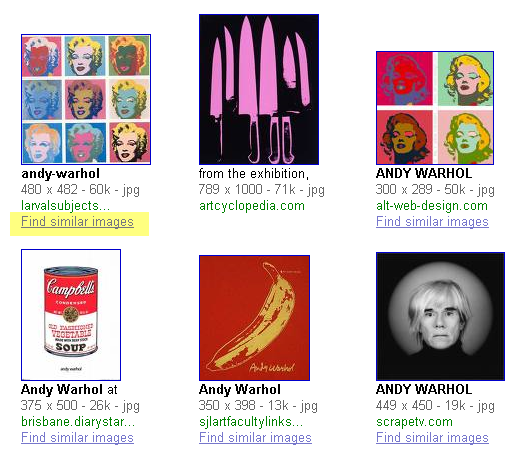 A more recent feature to be added to image search is â€œFind Similar Imagesâ€�. 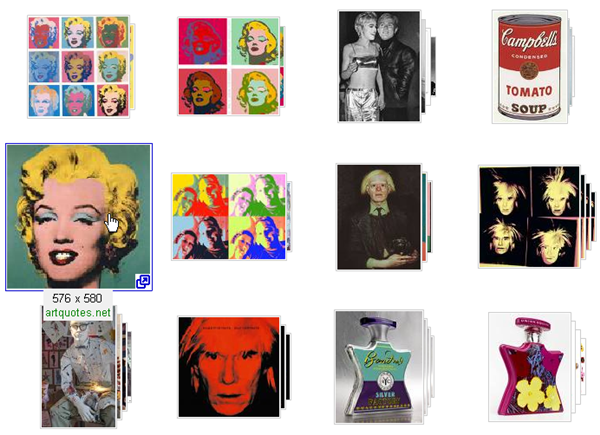 After searching for â€œAndy Warholâ€� through Image search, Google returns a large number of results as thumbnails. Underneath the thumbnail dimensions and the URL of the page it sits on, the words â€œFind Similar Imagesâ€� appears. Click on the link and a new set of thumbnail results is returned, narrowing down the search further. Note that this is not available yet on every image but it is appearing more and more. 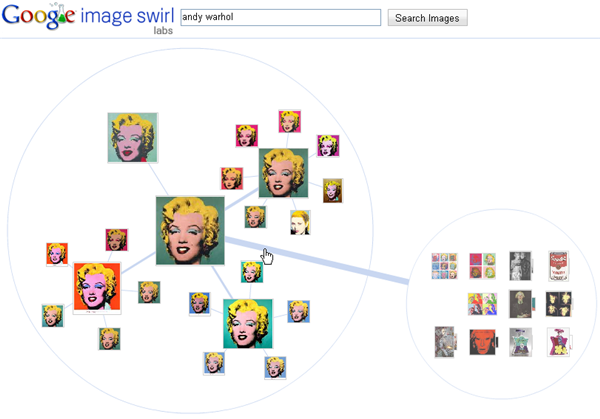 Google labs continue to work on image search and their new experimental service called Google Swirl allows you to customize the image search results. Google Swirl results return 12 thumbnails. When you rollover a thumbnail the image increases in size and displays dimensions and file URL. Each thumbnail on the initial results page represents an algorithmically-determined representative group of images with similar appearance and meaning. These aren’t just the most relevant images â€” they are the most relevant groups of images. Google states that currently, the service will work for more than 200,000 queries with plans to expand the service soon. You can test out Google Swirl on the Google Labs site and read more about it on the official Google blog. Have you tried out Google Swirl? What are your first impressions?